Due to some unforeseen technical issues with my ‘smart’ phone, I have lost the notes we made when we hopped, skipped and jumped off to Angel to sample some Austrian delights, so I’m having to ad lib this ever so slightly. I knew I should have stuck to the faithful pen and paper. On entering we were struck by how quiet it was. Traditional Austrian yodeling music would have definitely added some much needed atmosphere to the place. 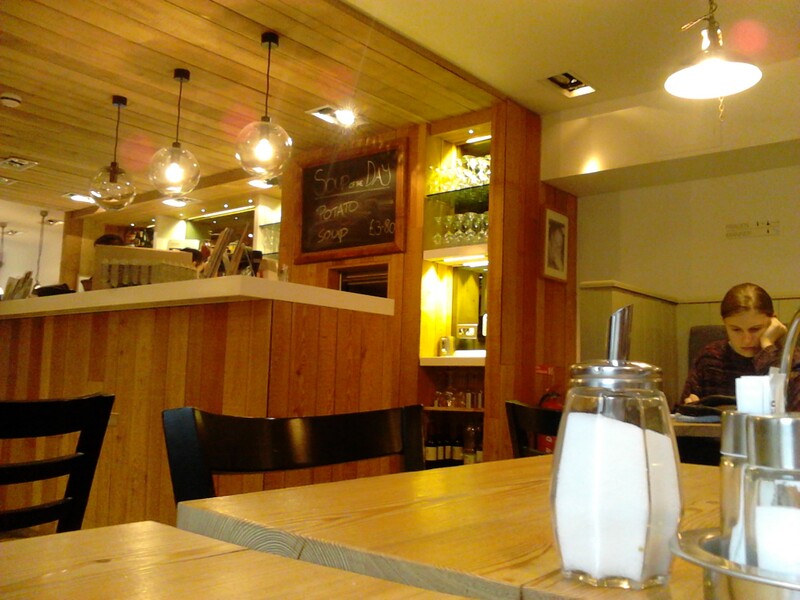 The cafe was full of people sat alone, studying or reading, and a business meeting or two. We had arrived to break the peace. After much deliberating, and sending the waiter away a couple of times, we had made up our minds. Austrian versions of French toast, not sure how traditionally Austrian this was, along with Viennesse coffee. French toast ‘Kipferl style’ came with homemade apple compote, fruit and cinnamon. This was good and the toast/compote/fruit/cinnamon ratio was just right. 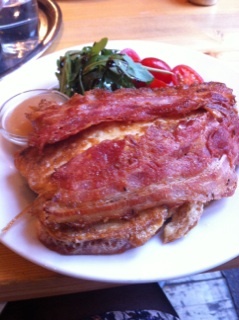 French toast ‘Holzhacker style’ was with Austrian bacon, and a nice side salad of rocket and tomatoes, plus apple compote. We were both slightly dubious of this combination but Ruth was pleasantly surprised and impressed. 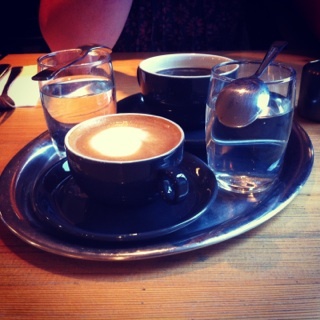 The Viennese coffees – perfect! Just as we had expected. Kipferl did us proud – fuelled us and livened us up ready for a day of exploring the sights and delights that the capital has to offer. This entry was posted in Uncategorized and tagged Angel, Austria, Camden Passage, Dining, dinner, Dinnergeddon, Eating out, Food, French toast., Kipferl, London, restaurants, Viennese coffee by dinnergeddon. Bookmark the permalink. 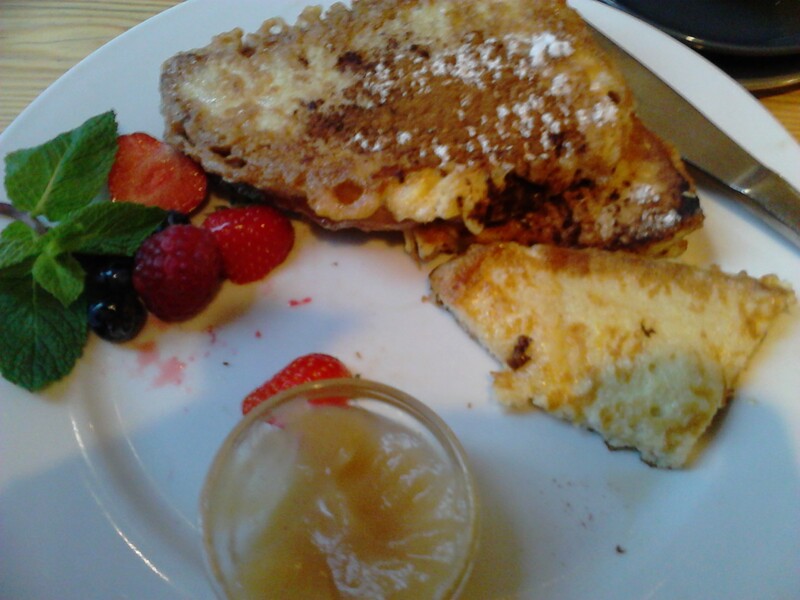 French toast and fruit looks nice….not sure about the bacon thing! Who’s the woman up the corner? !